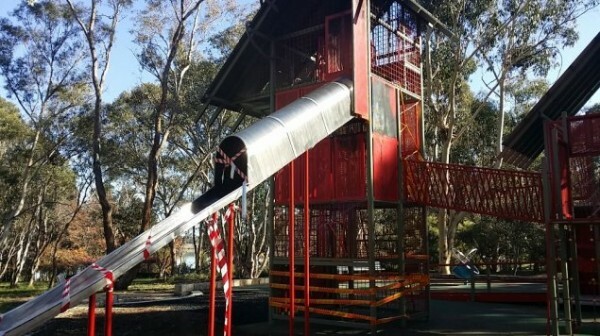 Vandals and arsonists have wreaked a trail of havoc in Tuggeranong, Gungahlin and Belconnen playgrounds and public toilets in recent weeks, contributing to the ACT’s annual vandalism bill of around $120,000. The string of incidents has included several fires affecting children’s play equipment and toilet blocks at Yerrabi Pond, Tuggerangong Town Park and John Knight Park. A fire in the Yerrabi Pond District Park public toilets last Wednesday caused damage to cubicles, and was the second incident within two weeks, with similar arson attacks on Yerrabi Pond and Tuggeranong Town Park facilities on May 17. Department of Territory and Municipal Services spokeswoman Fleur Flanery, who is director of city services, said a bin had been set on fire inside the snake house play structure at John Knight Park earlier in May causing extensive damage to paint and rubber surfaces. “The playground was vandalised for a second time when the rubber matting was again lit on fire and names carved into the playground surface. Fortunately, the equipment remains structurally sound and the playground was able to remain open,” Ms Flanery said. She said such vandalism prevented the community from enjoying public facilities and was a burden on the ACT Government budget. “It means resources need to be directed away from other important services. In addition to the cost of repairs, there are often ongoing costs when the replacement or redesign needs to be changed in an effort to mitigate further damage,” she said. Ms Flanery said the most frustrating examples of vandalism were those when the destruction of equipment was clearly planned rather than just a random act. Pictured are vandalised sites at Yerrabi Pond District Park and John Knight Park. If this is happening at the same locations, would it not be prudent to install a surveillance camera to at least get an idea of what the offenders look like? You can get battery powered hidden cameras that record footage in quite good detail for a few measly hundred dollars. I’m sure the $120,000 repair bill is worth at least spending a bit of money on a few cameras so the culprits can be caught in the act. Then again, they’re probably a bunch of teenage kids with deadbeat parents who couldn’t care less, so it won’t be worth the hassle of trying to prosecute them as a slap on the hand and no prospect of recouping costs isn’t worth all the effort.